Lily (Analeigh Tipton) is a new girl at Seven Oaks college, a university where “an atmosphere of male barbarism still dominates”. On her first day she is taken under the wing of a well established, self-assured group of girls determined to do good and help the depressed. Led by the vague, well-intentioned and almost uncomfortably up-front Violet (Greta Gerwig) the group runs a suicide prevention centre whose philosophy is based around tap dance and free doughnuts. 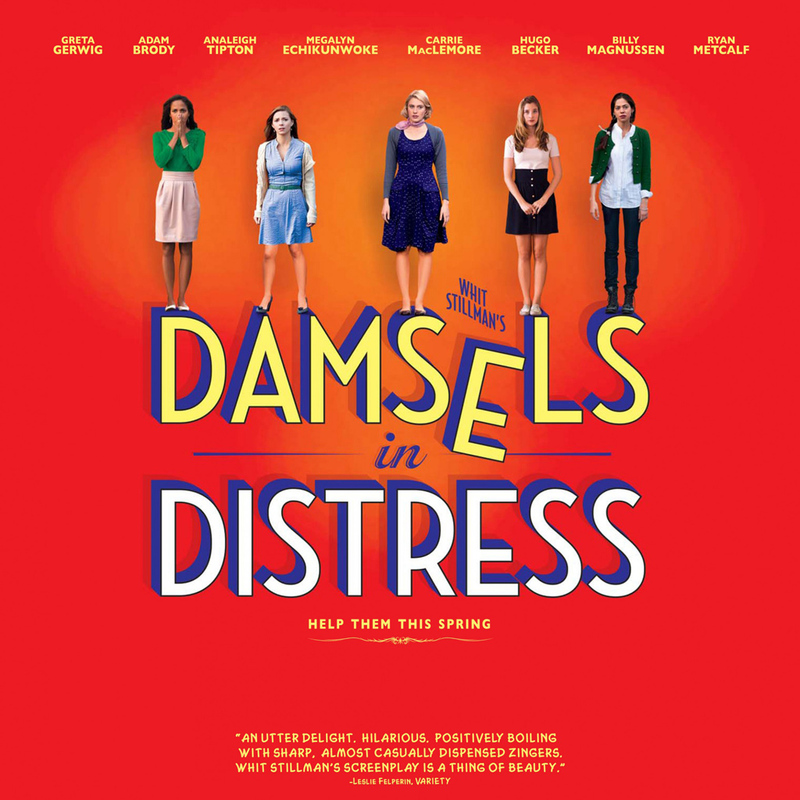 Damsels in Distress treads in familiar territory – but it does it in fifties heels and with a generous helping of the awkwardly blunt. For the first five minutes my mind was racing with comparisons: Clueless, Mean Girls, every college movie ever. Heather (Carrie MacLemore) is essentially my-breasts-can-tell-when-it’s-raining Karen slightly grown up. However the further in to the film you get, the further it veers off the expected course. I don’t know if it was just because it wasn’t what I expected, or because I wasn’t in the right mood, but I couldn’t fully click in with this film. I wanted to like it, and it had a lot of positive components but ultimately it was just a series of interesting and laugh out loud moments linked together by quirky characters rather than plot. The film walked the line between parody of the college movie genre and whimsical storytelling. Maybe if it had fully invested in one, the film would have felt more cohesive and less scattered; as it was it felt as though writer and director Whit Stillman was striving after eccentricity but just missing it. In one scene, Violet is walking through her dorm in tap shoes much to the irritation of another student who is sick of the noise. In response, Violet calls on her best friend and what ensues is what feels like a contrived dance number. There was an abundance of loose ends and promising storylines and characters which ended up leading nowhere. A lot of time and effort is put into setting up friction between Violet and Rick DeWolfe (Zach Woods) the editor of the student newspaper but after popping up briefly in a short subsequent scene, he was never seen again; a disappointment not least because his black clad character provided a good visual contrast to the candy and pastel colours dominating the main group of girls. Also he was attractive. Halfway through, the focus and protagonist changed; what was initially a story about new girl Lily and her love triangle and resultant sexcapades turned into an exploration of Violet’s own mental history and traumatic childhood. Probably a good thing in the end, as Lily’s character made me want to slap her constantly and then tell her to get some damned manners (in this scenario I am a hypocrite). It’s not a bad film. The cast were excellent, the subject matter good, but the longer I sat there, the more sudden leaps forward, the more title card intros there were, the more fed up I got. I enjoyed the non sequiturs and the abrupt dialogue. Aubrey Plaza dominated her scenes and was made of deadpan brilliance. The character of Thor was hilarious. Despite this though, I found myself checking my email, thinking about whatever happened to three-quarter pants, and just generally clockwatching. This film should have worked. Maybe it was the editing, maybe it was not having a solid idea of where to go with the storyline. Either way, maybe they should have taken on Violet’s philosophy – to take something which hasn’t realised its full potential, then to help them realise it or find more. This entry was posted in Film, Reviews, Uncategorized and tagged Analeigh Tipton, Aubrey Plaza, Damsels in Distress, Greta Gerwig, Whit Stillman. Bookmark the permalink.